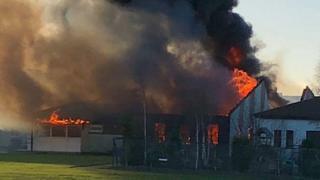 Pupils at a Fife school devastated by fire will not be able to return until Easter. More than 200 students and staff were evacuated from Cairneyhill Primary School near Dunfermline when the fire broke out on Friday. The whole school will be temporarily relocated to Tulliallan from Friday. Nursery pupils will be sent to Crossford Primary School. Pupils will be housed in Tulliallan Primary School and community centre. Headteacher Fiona Hall said: "I can't thank the staff, pupils and the wider community more for the way they have come together following the fire. "We have had so much support from a huge variety of sources both within and outwith the council. "I personally want to thank the staff, children and parents of Tulliallan for sharing their school with us for the time being. "It is vital that we get all our children together as soon as we can so that we can talk about what has happened and start to get back to normal."